The Orange Getaway Driver Overdrive Guitar Effects Pedal is an awesome "amp in a box" style overdrive that gives you unbridled energy at the click of a switch. The intuitive control layout means that you'll be up and running with awesome tones in no time, whilst the artwork is just as cool as the tones produced. With a headphone output that doubles as a CabSim connection, you have the ultimate live- and studio-friendly overdrive in your arsenal. The Getaway Driver has a Class A, single-ended overdrive gain structure with an internal charge pump for extra headroom. As you'd expect from the legends at Orange, the overdrive produced is truly sublime. The control layout comprises Volume, Gain, and Bite knobs for controlling the output level, overdrive level, and tone/presence control respectively. Whether you're after a little nudge or a full-on wall of sound, the Getaway Driver can do it all. As well as the Getaway output that delivers raucous overdrive to your amp of choice, the Headphone/CabSim output offers greater tonal flexibility. Thanks to some rather clever internal electronics, the CabSim outputs an emulation of a mic'd up Orange cabinet that is perfect for recording massive tones into your recording platform of choice. 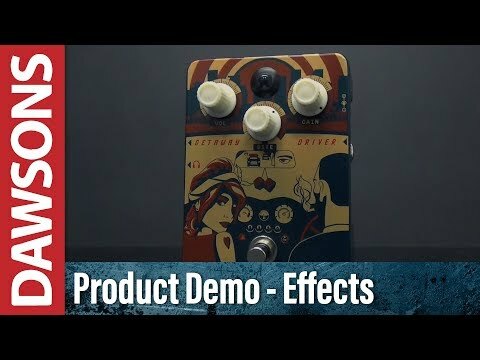 As we've come to expect from Orange, the Getaway Driver Overdrive Guitar Effects Pedal is built like an absolute tank, making it perfect for those who demand quality. The unique artwork is classic Orange, creating a visually captivating unit that is as elaborate as the tones it produces. Posted on 24/11/2017 by Chris Got this pedal and use it all the time. Sounds like a vintage amp when you but this into the front of a clean amp like my Fender.